I'm going to try to keep knocking out some of these cassettes I have lying around. Throughout the pages of this website, you'll see me saying how much I don't like the modern day cassette revival over and over again. I will say this about Here, I Made This For You: If there was ever an actual reason to make something a cassette only release, this is a pretty good one. Released on Cassette Store Day (That's seriously the best name they could come up with? What the hell is a cassette store?) 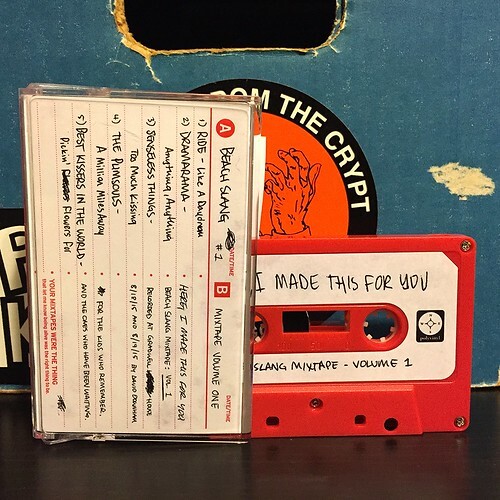 This tape is made up of five songs from other bands that Beach Slang has decided to cover. It's presented as an old school mix tape, something very near and dear to my heart. The band selection that they've decided to cover is great. They've tackled groups that are likely long forgotten by the vast majority of their fans like Best Kissers In The World, Ride, Dramarama, The Plimsoles and my personal favorite of the bunch Senseless Things. The Beach Slang version of "Too Much Kissing" really is stellar. It's even better than the Travis Cut version of the song, which is quite the compliment coming from me. Beach Slang take it slow and steady and have made a really spot on version of the original. You could argue that maybe they should have taken some chances with this song to distinguish it a bit more than the original, but for me it's really the vocals than shine through here as they have an earnestness and sincerity to them that really makes this song. This tape is labeled as "Volume 1"so hopefully this is something Beach Slang will revisit again in the future. If they're looking for songs, may I suggest some Mega City Four or Doughboys for volume 2?